To understand what’s going on in osteochondrosis, you need to understand a bit about how bones grow. Bones grow by initially forming a cartilage template, onto which calcium is deposited to form bone, (this process is called “ossification”, and when the cartilage has been turned into bone it is “ossified”). Osteochondrosis is an abnormality in this normal development of bones, and generally affects the joints. It resembles, but is distinct from hip dysplasia in many respects, in that it too is a developmental disorder of cartilage-bone formation. There are two main forms of osteochondrosis. If the problem occurs at the epiphyseal plate, then the overlying bone will not join properly to the main shaft of the bone. If the problem occurs at the joint surface, then a thickened area of cartilage develops which is only loosely attached to the underlying bone. This can shear, resulting in the formation of a flap. This is known as osteochondritis dissecans (OCD). Fragmented Medial Coronoid Process, (seen in all large breeds, but especially Retrievers, Labradors, Rottweilers, Bernese Mountain Dogs). Ununited Anconeal Process, (seen in GSD, Basset Hound, St. Bernard, and only rarely in other breeds). 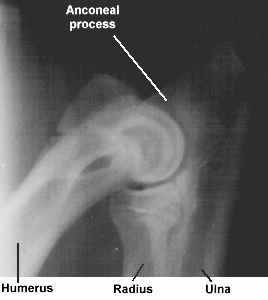 Osteochondritis Dissecans of the Medial Humeral Condyle, (seen in the Labrador, Golden Retriever and occasionally the Rottweiler). Of these, fragmented medial coronoid process is the most common. The locations of these problems are illustrated in the following pictures. In the first of these pictures, we are looking forwards at the elbow joint from the back. You can see how the ulna, (the long bone of the lower foreleg), overlies the humerus, (the bone of the upper foreleg). The inside of the dog, which we call “medial” is on the right, the outside, which we call “lateral” is on the left. On the diagram, coloured yellow, you can see the coronoid process, which is a small bony prominence on the ulna. The anconeal process is not visible on this view, but its location is indicated on the x-ray picture. Looking at the x-ray picture, you can see that the medial coronoid process is in fact, particularly difficult to see. This presents major difficulties in diagnosis (see also Treatment below). Shown in blue is the area of the humerus which is affected by OCD. In this next set of pictures, on the left, you can see what the ulna looks like from the side, in isolation of other bones; on the right, an x-ray picture of the elbow joint fully flexed (bent), also viewed from the side. You can see the anconeal process, colouredblue in the diagram, forming a hook which latches into a notch in the humerus. The anconeal process is easy to see on an x-ray picture, and the diagnosis of ununited anconeal process is usually easy. 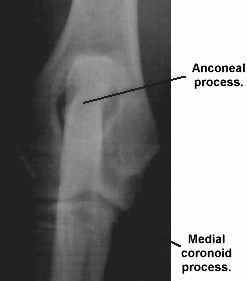 If the development of the anconeal process is affected, rather than fragmenting, it becomes detached from the ulna. We call this “ununited.” The red area shows the location of the medial coronoid process. There is only one type of shoulder osteochondrosis, and that is osteochondritis dissecans of the head of the humerus. The shoulder joint consists of the scapula, (shoulder blade), and the humerus, arranged as a ball-and-socket. The region of the humerus affected by OCD is always the same, and is shown on the diagram in blue. The stifle is only occasionally affected by OCD, especially in comparison with the elbow and shoulder. The hock joint is more commonly affected by OCD than the stifle, but less than the elbow and shoulder. The precise arrangement of the bones in the hock joint is very complex, and is beyond the scope of this article. The symptoms depend on where exactly the dog develops osteochondrosis, but lameness and pain in the affected joint are consistent features. The dog may try and compensate for the lameness by restricting the movement of the affected joint. So, if the elbow is affected, the dog may swing his leg outwards in a circular motion to avoid bending the elbow. Although the condition usually affects both sides (e.g. left and right elbows), one leg is often worse than the other. As a result, the dog may take extra weight on the better leg, resulting in decreased muscle development in the worst affected leg. Genetics. The concept of an inherited disease, where one individual acquires a disease from a similarly affected parent is familiar to most people. Osteochondrosis is an inherited disease. It’s not really quite that simple though, because not all dogs whose parents have osteochondrosis will actually get it themselves. Secondly, not all dogs with osteochondrosis are lame, and some seem to go for years before any problems become evident. Having said that though, genetics are very important in osteochondrosis, and the inheritance factor is even more important than in hip dysplasia. Environment. Quite why some dogs don’t develop osteochondrosis, when they really ought to, based on their parentage, is not fully known. So we introduce another factor which we loosely call the dog’s “environment” to try and explain this. However, there are two significant things which do seem to play a part: diet and exercise, though there may also be other factors waiting to be discovered. Diet. This is covered fully in the diet section of the puppy pages. Basically “over nutrition”, especially of calcium, phosphorus and calories is believed to play a part. Most people who buy a large breed puppy want it to be big. There’s nothing inherently wrong with that, but if you pursue this too vigorously, and overfeed the dog, or unbalance his mineral intake with supplements, then growth and development will not proceed correctly and osteochondrosis can result. Exercise. The abnormality in osteochondrosis is the defective transformation of cartilage into bone. If a pup uses an affected joint too much, the defective cartilage can separate from the bone to which it is attached. This causes pain, instability of the joint, and starts the process of arthritis, which is an attempt by the joint to stabilise itself. By restricting the amount of exercise that the puppy has, you can limit the development of osteochondrosis, (see also Prevention below, and the Exercise section of the puppy pages). • During the acute phase, when the dog is growing. • During the chronic phase when the dog has stopped growing. There are two principle modes of treatment, irrespective of the joint involved in osteochondrosis: conservative treatment or surgery. Pain relief. On the whole, pain relief is achieved using a family of drugs which we call NSAIDs (Non Steroidal Anti-Inflammatory Drugs, pronounced en-sayed). There are a myriad of these, and are discussed more fully in the arthritis section. Meloxicam (Metacam®). Meloxicam is a very effective pain killer. It has an excellent safety profile, rarely causes vomiting, and almost uniquely amongst the NSAIDs, actually improves the condition of an arthritic joint, rather than simply relieving pain. Because of this, with long term use, it is often possible to gradually reduce the dose. This drug is presented differently from most NSAIDs in that it is available as a syrup, with it’s own dosing syringe. Practically, this means that the exact dose can be given to the dog, regardless of his weight. With tablets, this is not always possible as you are constrained by the size of the tablet, giving only a close approximation of the required dose. This is particularly useful in reducing the dose, as very small adjustments can be made. Meloxicam is currently the drug of first choice in the treatment of the pain of osteochondrosis at Vetrica. Carprofen (Rimadyl®, Norocarp®). Carprofen is also a very effective pain killer, even for quite severe pain. It has a good safety profile. It is only available tablets. It is safe to use long term, and side-effects are rare. The tablets are small and easy to administer. At Vetrica, carprofen is currently the second choice drug for the treatment of the pain of osteochondrosis. Aspirin – Aspirin is cheap and readily available, although unlicensed for use in dogs. While generally safe for use in dogs, and quite good as a painkiller, especially for mild pain, aspirin commonly causes vomiting, and both the drugs listed above have a much better safety profile. (Aspirin should not be given to cats except on specific veterinary advice). Ibuprofen (Nurofen®). NEVER GIVE THIS TO A DOG. Although it is safe for use in humans, it is toxic to the kidney in the dog, at doses close to those used therapeutically. There is no reason to use ibuprofen in dogs. It is unlicensed, and there are safer and more effective drugs available. Another drug to be considered here is pentosan polysulphate (Cartrophen Vet®; not to be confused with carprofen). This is not a classical NSAID, and has no intrinsic pain relieving activity, but acts to relieve pain by improving the status of the joint. This drug is given by injection at weekly intervals, usually on four separate occasions. The drug acts in many different ways, but basically serves to improve the environment in which the joint cartilage is in. It doesn’t work in every case, but approximately 80% of individuals will show a worthwhile improvement. Painkillers are not allowed while the drug is being administered. It is virtually side-effect free in young animals. In cases of confirmed osteochondrosis, where surgery has been discounted, we usually recommend a course of Cartrophen Vet®. Exercise Control. All large and giant breed puppies should receive only regular short walks until they have finished growing. If they have osteochondrosis, then this is particularly important. Affected dogs should be restricted to the lead, and given three 10-15 minute walks per day only. See also the Exercise Section of the Puppy Pages. Dietary Control. Overfeeding contributes greatly to many orthopaedic conditions. Osteochondrosis is one of these, and it is very important that any vitamin or mineral supplements are stopped immediately. Feed a good quality dog food designed for growing dogs. Many dogs with osteochondrosis are the best looking, biggest and fastest growing in the litter. These are the dogs that managed to push out the litter mates from the feeding bowl, and are growing too fast. Reduce the total calorie intake to that recommended by the feed company. This is discussed more fully in the Diet Section of the puppy pages. There are a number of surgical techniques available for the treatment of osteochondrosis, depending on which type your dog has. Osteochondritis Dissecans. No matter what the site: shoulder, elbow, hock or stifle, the procedure is basically the same for the treatment of OCD. The loose flap of cartilage is removed under general anaesthesia. The results are generally good, and most dogs return to full fitness. In dogs less than this 6 months old, the flap can still heal so it may be worth waiting to see if the lameness disappears. The surgery should not be delayed beyond 6½ months of age, because if the dog is still lame it means a non-healing flap has occurred. Ununited Anconeal Process. The procedure here is to remove the loose piece of bone. The anconeal process is a hook which latches into a notch in the humerus. This is an important structure which stabilises the elbow joint. Despite that, simply removing the anconeal process usually gives good results, even though the elbow is less stable than a normal elbow joint. Techniques are also available to pin or screw the process back to the ulna. Fragmented Medial Coronoid Process. This is the most frustrating of all the variants of osteochondrosis to treat. The first problem is being sure that this is in fact the cause of lameness, and that the elbow is not painful for some other reason. The medial coronoid process is a very difficult structure to visualise by x-ray. In theory, removing the bone fragments should sort the problem, but they are often so small that even where the surgeon is confident of the diagnosis, they are impossible to find, buried in a mass of fibrous connective tissue. Added to that, even where a large fragment is found and removed, the dog does not always stop being lame. Overall, the results of surgery are no better than conservative treatment. So, from a practical viewpoint, conservative treatment is probably the best first option, surgery being reserved for those that fail to respond over a reasonable amount of time (about a month), or where a large bone fragment is clearly visible. In many dogs, the original osteochondrosis problem has gone unnoticed, and the dog has reached adulthood with little or no treatment. The dog may have responded favourably to conservative treatment, or have undergone surgery, with less than satisfactory results. The outcome for practically all these cases is arthritis of the affected joint. The treatment of arthritis is covered fully in the Arthritis Section. If we think about what causes osteochondrosis we can go on to form a rational plan to prevent its occurrence. This is primarily an hereditary disease with an environmental input, and it is at these two features that we can direct our efforts to prevent dogs from developing osteochondrosis. The genetic component is very important in osteochondrosis. If we only breed from dogs that are free of the disease, it should follow that the pups will be free of the disease. There is a problem here in that not all dogs with osteochondrosis are lame. Some dogs may have had no history of lameness whatsoever; others may have had a minor problem when growing, which responded well to conservative treatment. At the time of breeding, the dog may well be free of pain and lameness, but still be carrying the disease. Diet. This is covered more fully in the feeding section of the puppy pages. You must not overfeed large and giant breed puppies. Feed only a good quality food which has been properly balanced for growing dogs. NEVER GIVE VITAMIN OR MINERAL SUPPLEMENTS. Exercise. This is covered more fully in the exercise section of the puppy pages. Just to emphasise the point. GIVE REGULAR LIGHT EXERCISE ONLY TO LARGE AND GIANT BREED PUPPIES. 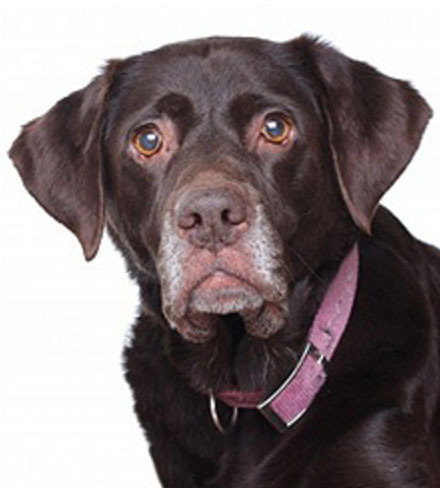 The outlook for dogs with osteochondrosis depends on which joint is affected. For OCD of the head of the humerus, medial condyle of the humerus, or stifle, it is invariably good, with treatment. Most dogs are completely free of pain and lameness after surgery. Dogs with an ununited anconeal process generally do very well also, especially if the dog is not required for very athletic work.